Heres' a new business model for Tuneful Tuesday: Free, advertising supported music downloads. Think of a cross between typical P2P and Myspace, and you get SPIRALFROG (formerly Musicloads). The thinking behind this is as follows: For every one legal download, there are 40 illegal (i.e., free) ones. Let's put up a site where we can capture some of the free downloadable music market, deriving revenue via advertising method (perhaps a 3rd party such as Google or Yahoo?). The target demographic market is the 13-34 year old age group. They are not so much competing directly versus ITMS as they are versus Limewire and Kazaa. - Is it iPod compatible? - How intrusive are the commercials? - How restrictive is the DRM? The answers to these often determine how succesful the site will become. In SpiralFrog's case, the answers are no, not sure yet, and somewhat. iPod Compatibility: No iPod compatibility? That means from day one, they are forsaking 75% of the marketplace. 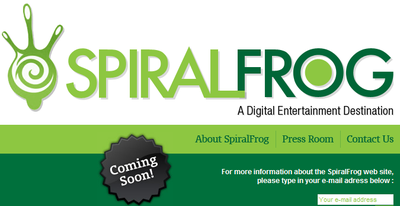 Indeed, Spiral Frog is not Mac compatible (not initially, anyway). That's a tough way to begin a new product, eliminating a huge swath of the market from consideration. Its tough to compete with cheap, easy to use, advertisement free, modestly workable DRM. SpiralFrog responds to this by saying they are not competing with ITMS, but rather, are supplemental to what Apple offers. If you only want a 30 second clip before you buy a song, then you can go to iTunes. However, a full version of a song, along with additonal band info and a "MySpace" like community around each band could be a compelling proposition of the under 30 set. Microsoft Zune: Not compatible with Microsoft's upcoming player Zune either; See above. Free versus Cheap: Will "free" be the key to breaking Apples grip on legal downloadable music software and devices? That's a long shot -- most iPod owners have an extensive collection of music from beyond the iTunes Music Store. Their own CDs are a primary source, along with CDs of friends as the next source, and then P2P comes third. (If you want to say P2P trumps CDs for younger users, I won't argue with you). I doubt they will cut into any of Apple's sales, but no cost, legal and virus free might give P2P sites a run for their money. Restrictive DRM: 1 PCs and 2 portable devices per user. Kinda skimpy rights offering. The Short Attention Span Generation: Each song takes 90 seconds to download, and while that is along time, the company hopes to keep viewers entertained with Concert information, videos, band discographies, photos, lyrics, etc. -- all the trappings of a serious music site. There are also plans for colloborative filtering -- as in "If you like this band, then you will like that band." This is to my mind the toughest part of any advertising dependent site. Some of the most successful new technologies of recent years have had as part of their appeal a way for the user to control information/content themselves, and avoid the annoying and intrusive advertising. Think RSS, iPod, Satellite Radio, and TiVo. On the other hand, Google is the most successful of all internet companies. Their advertising is discrete and unobtrusive. So an advertising model could possibly work be tolerated -- assuming its not pernicious popups or "watch to play" commercials. Marketers don't think “pre-roll” ads that run before or perhaps during the downloading process are effective. That's one of reasons YouTube was a monster hit, while iFilm was not. The "watch-to-play" pre rolls was one of the major differences. I will reserve final judgement until I see what SpiralFrog looks like in December, but the concept is certainly intriguing. I don't know (but will go find out) why these folks would not be iPod compatible since (allegedly) others can (allegedly) download thousands of (allegedly) purloined songs from (allegedly) copyright-violating sites. As for Zune compatibility, I would assume this has to wait until fifteen minutes after Zune is released so that some eight year old in Fedonia can reverse engineer and publish the format. p.s. I don't even OWN an iPod or MP3 player and have more CD's than most record stores (remember record stores? ), so don't come snooping round here looking for stolen content. You wouldn't like my eclectic tastes either, so don't come looking for the collection either.